As the five Kingdom Keepers enter high school, everything is about to change. The Maintenance Base that controls all four parks in Disney World is under attack by the Overtakers, a group determined to change Disneyforever. Relationships between the Keepers are no longer as simple as they once were. In fact, nothing is as simple as it once was. An after-hours visit to Typhoon Lagoon is a game changer. The Keepers lose one of their most valuable supporters. But there's work to do . . . The Disney Dream leaves Port Canaveral on an historic cruise to Los Angeles with a special treat in store for guests: the Disney Host Interactive guides are on board. Finn, Maybeck, Charlene, Willa, and Philby join guests as the DHI experience moves to one of the most advanced cruise ships in the world. But all is not right below decks. Strange things are happening. Only the Kingdom Keepers know the truth behind their invitation to be in attendance: nearly every Disney villain is aboard the ship, including Maleficent. The Overtakers have infiltrated the cast and crew. And no oneknows what they have planned. The Dream sets sail filled with enthusiastic guests and crew. But not for long. Maleficent takes over a video screen and warns the guests of trouble to come. 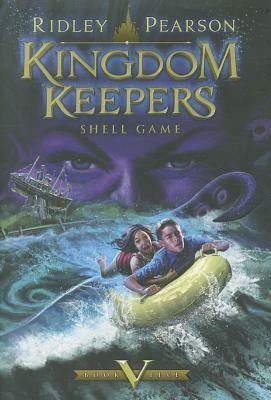 With the ship arriving to the beaches of Castaway Cay--its first of many exotic ports of call--the Kingdom Keepers are under attack; back home the Base is threatened and about to fall. The Overtakers have expanded in ways never foreseen, and it's clear they intend to use this element of surprise to accomplish what has eluded them so far: victory. But not if Finn Whitman and friends have anything to say about it. Ridley Pearson is the award-winning co-author, along with Dave Barry, of Peter and the Starcatchers, Peter and the Shadow Thieves, Peter and the Secret of Rundoon, Peter and the Sword of Mercy, Escape From the Carnivale, Cave of the Dark Wind, Blood Tide, and Science Fair. In addition to Kingdom Keepers: Disney After Dark, Kingdom Keepers: Disney at Dawn, Kingdom Keepers: Disney in Shadow, and Kingdom Keepers: Power Play, he is also the author of the young adult thrillers Steel Trapp: The Challenge and Steel Trapp: The Academy. He has written more than twenty best-selling crime novels including Killer View and Killer Weekend. He was the first American to be awarded the Raymond Chandler/Fulbright Fellowship in Detective Fiction at Oxford University.